← Day of Archaeology in D.C.
A little over a month ago one of our loyal volunteers, Emiko, reported on a tiny seed bead she had found while picking through materials in the CART lab. Many of you may be wondering what picking is and how we come by this material. During excavations at the “Cemetery Site” we have changed up the methodology in our screening and collection processes. The site has intact cultural fill layers above the brick foundation which we have been carefully exposing since January. The diagnostic artifacts do not date later than the 1770’s, therefore we are treating these layers similar to the way we treat other archaeological features at Old Colchester Park and Preserve (OCPP). 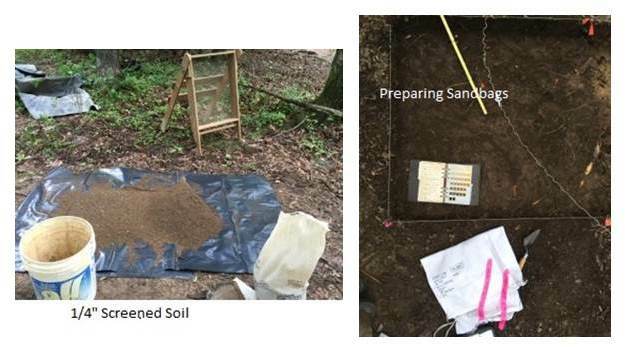 The soil is first screened on site through ¼” mesh over tarps, removing larger artifacts and materials we commonly discard (brick bits, mortar, and small oyster shell).The soil is then placed in sandbags to be removed from the site. These sandbags end up in a storage facility we have at the Enyedi Property. 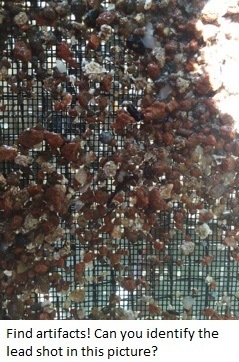 About twice a week one of the CART members takes on the task of water screening this soil through window mesh screen. That’s right, window mesh. The same type of screen we use at our homes on windows- the very small screen most tiny bugs cannot even slip through. 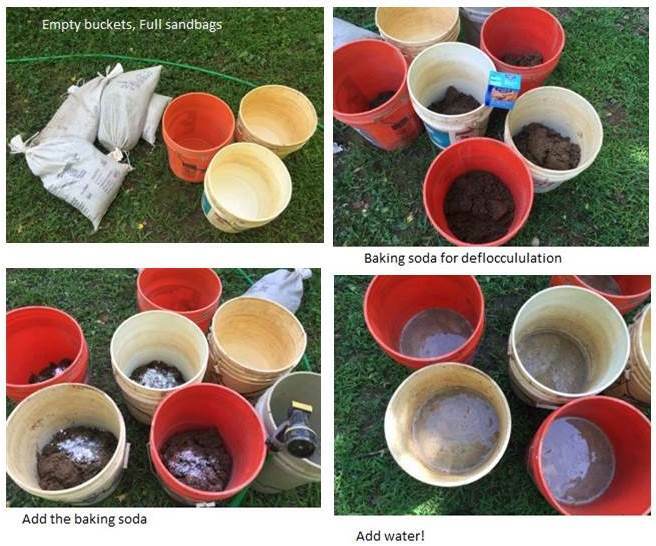 Typically we empty a sandbag into two buckets, add baking soda, water, and stir. The baking soda helps to break down clay soils making it eaisier to pass the soil through the small gauge screen. We call this process deflocculation. The screener also has to be careful to not mix up proveniences- or where on site the soil has came from. When we bring the bags in from the field we put them in piles being sure to keep the FS (field specimen) numbers together. The FS is assigned in the field and we use this number to trace the materials all the way through to the cataloging process. For each level of soil within a test unit, CART assigns a separate FS number for ¼” dry screened artifacts, WMS (window mesh screen) samples, and flotation samples. 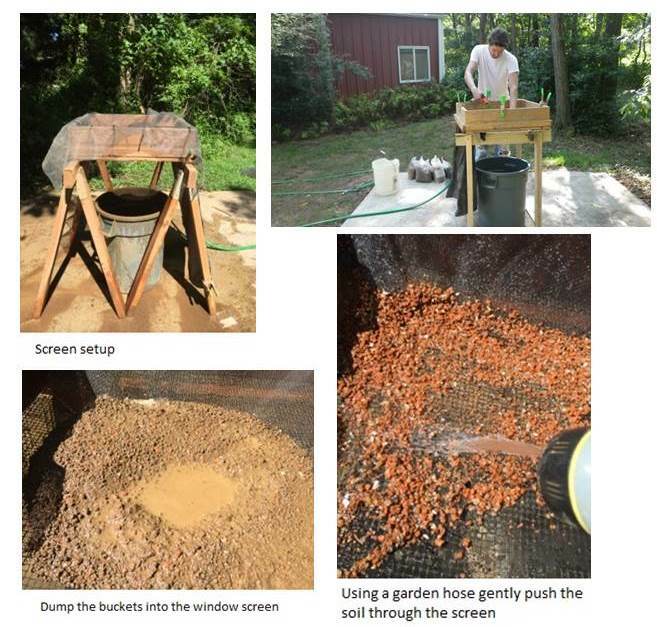 After the soil has had time to deflocculate, helped by the agitation of stirring, the buckets of water and mud is dumped into a ¼” screen covered with window screen, held up by saw horses, over a garbage can. The garbage can is meant to collect the silt and other materials too small to even stay in the window screen. Staff then uses a garden hose, sprays the soil and gently pushes the wet soil through the mesh. Repeating this until all the bags with corresponding FS numbers have been processed. Every once in awhile during the screening, before bringing the samples back to the lab the screener will find one of the small artifacts we are attempting to save- beads, seeds, lead shot, straight pins, fish bone or scale, other faunal bone, glass, ceramic, microdebitage, and shell. The material is then removed from the larger screen and brought inside the Enyedi Barn where the window screen is laid flat to dry before it is packed up and brought back to the lab. Once in the lab it is checked in by staff and will eventually make it to the lab table to be gone over (picked) with the greatest of care. We are the County Archaeological Research Team, part of the Archaeology and Collections Branch, Resource Management Division, Fairfax County Park Authority. We are tasked with understanding and managing the cultural resources on Park land throughout Fairfax County. 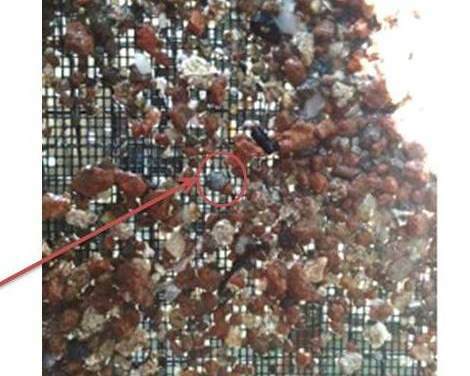 This entry was posted in Archaeology and tagged archaeological method, flotation, picking, Water-screening. Bookmark the permalink.